Posh celebrate their opening goal at Peterborough Sports scored by Joe Ward. Photo: Joe Dent/theposh.com. Like England at the World Cup, Peterborough United can only beat the opposition in front of them. Unlike Gareth Southgate’s team, Posh probably won’t be getting universal praise for demolishing inferior teams, although their summer ruthless streak has been impressive to behold. 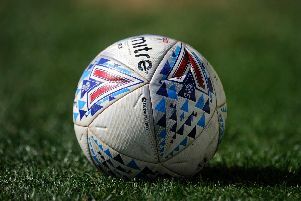 This 9-0 rout of Peterborough’s second-best club made it 18 goals in three matches against opponents who ply their trade several divisions below Posh. Eight different players managed to get onto the scoresheet tonight in the latest bout of target practice. The quality of many goals has been undeniable. Siriki Demble scored with both a 20-yard rocket and a clever flick to make it four pre-season goals in 135 minutes of action. Posh probably have their next headline-making sales pitch already lined up. Posh scored three in the first-half at PSL through Joe Ward, Tyler Denton and Danny Lloyd. Ward bundled in Denton’s left-wing cross, Denton netted his second goal in two appearances with a sweet strike and Lloyd struck from just inside the area with a fine drive. Dembele was joined on the list of scorers by Mark O’Hara - his first for the club - Morgan Penfold, Gwion Edwards, from the penalty spot, and George Cooper who curled a beauty into the top corner in the final stages. Gwion Edwards scores from the penalty spot for Posh against Peterborough Sports. Photo: Joe Dent/theposh.com. Denton played in front of left-back Colin Daniel in a move that worked, although judging players in these games is rather pointless. Peterborough Sports have achieved great things under the stewardship of former chairman Stephen Cooper and manager Jimmy Dean, but they’re not yet ready to compete closely with their illustrious neighbours. Posh (first half): Aaron Chapman, Jason Naismith, Colin Daniel, Rhys Bennett, Josh Yorwerth, Alex Woodyard, Joe Ward, Louis Reed, Mathew Stevens, Danny Lloyd, Tyler Denton. Posh (second-half): Aaron Chapman, Sam Cartwright, Jack Baldwin, Ryan Tafazolli, Lewis Freestone, Gwion Edwards, Mark O’Hara, Anton Rodgers, George Cooper, Siriki Dembele, Morgan Penfold. Sub for both halves: Godden. Goals; Posh - Ward (18 mins), Denton (23 mins), Lloyd (26 mins), Dembele (49 mins & 80 mins), O’Hara (61 mins), Penfold (68 mins), Edwards (75 mins), Cooper (89 mins).